The company prepares - in your bathroom, of course! Up to three performances of 25 minutes each will be presented in your home. 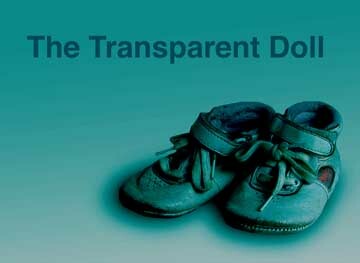 The Transparent Doll by Rachild - In this interpretation of Rachildes text the life of a child is at stake in a game of fear, loss, rejection and insanity between a man and a women. The action takes place in your living room. The Tragical Comedy or Comical Tragedy of Punch and Judy - The traditional tale of domestic violence is presented with a contemporary twist brought up to date and retaining all it's unexpurgated bawdy glory (definitely not for children). 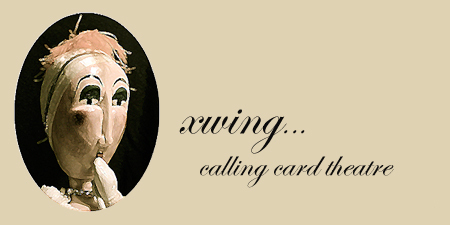 This performance is based upon the text as it was first seen and written down in English by John Payne Collier. This performance is presented indoors in a traditional puppet booth. Pleasure by Rachilde - In another interpretation of Rachilde you are invited to experience the tension as two adolescents tease and taunt each other. Are they siblings? Are they lovers? Is it suicide or murder that they are contemplating? The action takes place at your dining-room table. Confessions of this centuries child - Pere Ubu comments on current affairs. - A selection of Ubu's Almanac by Alfred Jarry translated and improvised by the company. 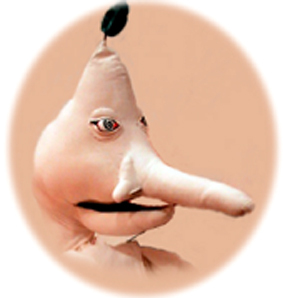 At the stroke of midnight Ubu is awoken from a deep and troubled sleep. 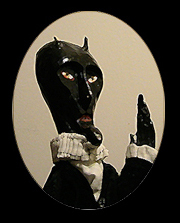 Disturbed by the meaning of his dreams, he consults his conscience... To be performed in your bedroom. 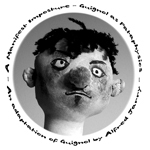 Guignol by Alfred Jarry - a revival of the acclaimed 2004 xwing debut of 'A Manifest Imposture' this version is both an adaptation of Jarrys text and a reduction of the xwing debut. Pere Ubu installs himself in the household of the kindly and unsuspecting Mr. Achras. There ensues a symbolist drama with the enevitable murderous results. 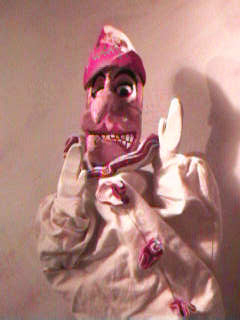 This performance is presented indoors in a traditional puppet booth. Here and There - An interlude inspired by the Samual Beckett play Come and Go. Three figures are sitting side by side selectively they share secrets and explore loyalties. This pensive conversation is for your living room.